Eat Healthy! 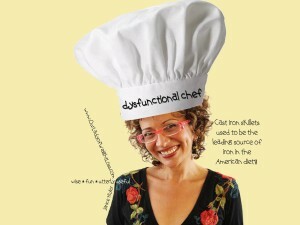 w/ Janice Taylor, your favorite Dysfunctional Chef. I’ve gone mad with power, “spiralizing” my way through the kitchen. Cucumber noodles, zucchini noodles, beet noodles, alike! I don’t generally endorse products, but I’m having so much fun with the Spiralizer, the best gadget/kitchen aide that I’ve purchased in eons, that I just had to share the excitement and the vegetable recipes. Because, Our Lady of Weight Loss devotees, and Tushkateers (members of the Kick in the Tush Club), if you want to increase your healthy food intake and/or lose weight, then eat more vegetables! Sometimes it’s that simple! This Zucchini & Garbanzo Bean (a.k.a. Chickpea) Salad is a great summer salad. No hot oven blasting, just you spiralizing, in the kitchen, humming a happy tune! Spiralize the zucchini. Place in large bowl. Add garbanzo beans, chopped red onion, and orange pepper. In small bowl, whisk together the remainder of ingredients. Drizzle dressing over zucchini mix. Gently toss with love. Cover and refrigerate for a minimum of 6 hours. Hungry for (almost) daily motivational musings from our country’s premiere Anti-Gravity Coach, Janice Taylor (that’s me), join Our Lady of Weight Loss’s Kick in the Tush Club/FB!?! For the full skinny as well as Anti-Gravity Specials, sign up for Janice Taylor’s (monthly) Kick in the Tush Club newsletter!